You should see his face when he's looking at the Coyotes's balance sheet. Wayne Gretzky probably chose poorly. When you're The Great One, and you retire, and you have club after club offering you ownership stakes and coaching positions and general manager responsibilities, you could probably do a bit better than to settle on the Phoenix Coyotes. Arizona's beautiful, sure, but that's a struggling franchise in a struggling league if ever there was one, and Gretzky might have done well to pick somewhere a little more, shall we say, stable. Court documents show that Gretzky could lose up to $9.3 million US should Balsillie's bid fail in the bankruptcy case. The report indicates Gretzky would receive as much as $22.5 million of the $212.5 million bid, including $8 million in deferred payments and $14.5 million to resign as the head coach of the team. Now here's the interesting part: Despite all this money Gretzky stands to make from the sale of the team and its eventual move to Canada, Gretzky has instead thrown his support behind current Chicago White Sox and Bulls owner Jerry Reinsdorf's attempts to buy the team. But why? Does Gretzky want to stay, and thinks his position would be in jeopardy under Balsillie? What gives? 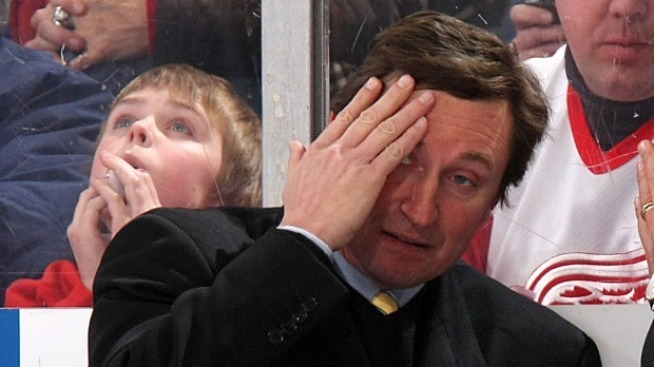 The Coyotes are a mess, and as coach and part-owner, Gretzky remains by the club's public face. Whatever happens to the Coyotes happens to Gretzky. Especially when it comes to money.